AN IMPORTANT MOMENT in the life-cycle of this Dublin team took place with 10 minutes left in their routine win over Carlow. Regular free-taker Dean Rock left the action in the 58th minute, with six converted frees to his name. 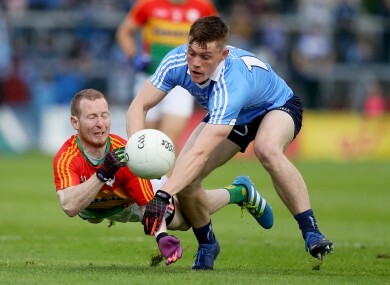 Dublin were awarded a free in front of the posts two minutes later, but despite the presence of Bernard Brogan on the field, debutant Con O’Callaghan stood over it. Brogan was typically Rock’s understudy and took the close-range frees when the Ballymun attacker was withdrawn in the past. But Brogan left it to the young Cuala forward to split the posts from that dead ball, and another one five minutes later. It may seem significant, but it’s a clear sign Jim Gavin has recognised the need to keep things fresh in his squad. Last night felt like a changing of the guard in the Dublin attack. O’Callaghan started at full-forward with Brogan relegated to an impact sub role off the bench. Debuts were the order of the day. Four of the nine forwards who featured in Dublin’s attack last night were making their championship bows. O’Callaghan got little joy out of a packed Carlow defence, oceans apart from the wide-open spaces he enjoyed in Dublin’s recent All-Ireland winning U21 campaign. He was joined on the field by Cuala team-mate Mark Schutte, who also made his senior football debut for Dublin yesterday. “I’d know Mark, he won an All-Ireland with his (U-21) team a few years back,” said Jim Gavin after the game. “We know each other quite well, obviously he’s been brought in on his club form, he’s been outstanding with Cuala. Schutte came on for the impressive Niall Scully, while Conor McHugh also arrived off the bench and kicked a fine score. “I thought Niall did well,” added Gavin. “I thought all the forwards played well, he did his part in our game-plan and tagged on a nice point as well. The team continues to evolve, but Brogan looked sharp on his introduction and curled over a good effort off either foot. Dublin scored 0-19 points against a team that built a wall across the 45. Paul Flynn and Cormac Costello have yet to return from injury, to further bolster Gavin’s hand up front. Email “Con O'Callaghan, Bernard Brogan and the changing of the guard in the Dublin attack”. Feedback on “Con O'Callaghan, Bernard Brogan and the changing of the guard in the Dublin attack”.